There are thousands of college aged individuals, young adults, adults with families, and even the elderly who are all struggling to get by and tend to live paycheck to paycheck. And as the cost of living continues to rise, it doesn’t seem this form of “barely getting by” will change for many any time soon. If you find yourself or someone you know in a financial rut, keep in mind that there are still a good amount of alternatives that can be used and efficiently implemented to make the required amount of extra income needed to make a financially suitable living. Such alternatives consist of, but are not limited to: getting a short term loan like auto title loans, taking up a second job, getting a revolving line of credit, having a yard sale in your neighborhood, moonlighting, selling items online, etc. Some, none, or even all of these scenarios may or may not be possible for someone but the good news remains, there are still plausible alternatives. Auto title loans: Auto title loans are short term loans that may be perfect for those who own their own vehicle and may not have a good enough credit score to get a more traditional loan. Loan amounts generally range from $500 up to half of the vehicle’s total value. Second job: Taking a second job requires a lot of time and effort to go into making it worthwhile, but if you can find a part-time job that doesn’t interfere with your current occupation this is a great way to get a head start efficiently. Revolving line of credit: A revolving line of credit is a specific type of credit that doesn’t have an exact fixed amount of payments, as opposed to an installment credit. If you’re still not too sure what a revolving line of credit consist of, take a look at several companies that do offer it to make your own opinion. 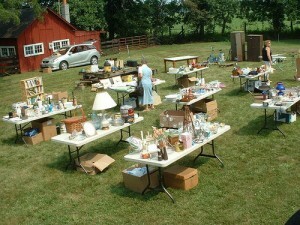 Yard Sale: Selling unwanted items that may be taking up space around your home is one of the oldest, but still extremely efficient methods to earn extra money. BONUS: you get to get rid of a lot of clutter that may be lying around your home. Moonlighting: Moonlighting is similar to taking up a second job but it really involves using a skill that you have in order to make a profit. Giving guitar lessons for example is a perfect and profitable type of moonlighting case. Sell items online: There are many sources available online to sell your unwanted items for a fair price, sometimes for well more than what you thought the item was worth. Such sources like eBay and Craigslist have all proven successful for people worldwide.